At MHM we are increasingly being asked how owners can successfully re-design and extend the typical double and triple fronted brick houses. These suburban beauties, often with subtle art deco elements, require thoughtful and simple respectful designs to truly celebrate their unique style. 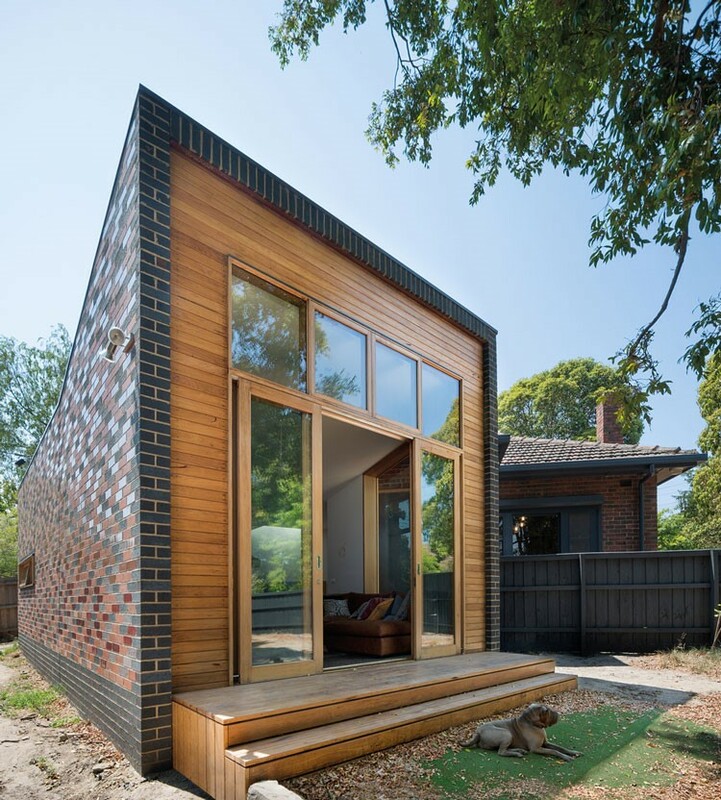 This design by Melbourne based architects WoodWoodWard Architecture does great things with the humble clinker brick. Originally clinkers were bricks that had been fired in a kiln many times at very hot temperatures. The dark and purple colours are the result of volcanic-type reactions to the extreme heat – the Arts and Crafts styles incorporated them and in the interwar period they became popular. This was a project with a relatively limited budget that would not have been easy. The new pavilion addition is situated on a triangular corner block with a large front yard and a limited backyard. The clients’ brief was for a sustainable, flexible living space; contemporary but sympathetic to the existing building in its context. Located on a triangular site, the original house had four yards and three street facades. This unusual arrangement provided opportunities as well as constraints. The new design provides great street presence but also manages to make clever use of the left over space by straddling three of the yards and attaching the pavilion to one of the facades. The yards have been inverted, turning the front into a big backyard for the kids and dog to play in, enclosed by new fencing. The new house has been labelled the ‘Forever House’ as the owners asked for a house in which they could stay ‘forever’. 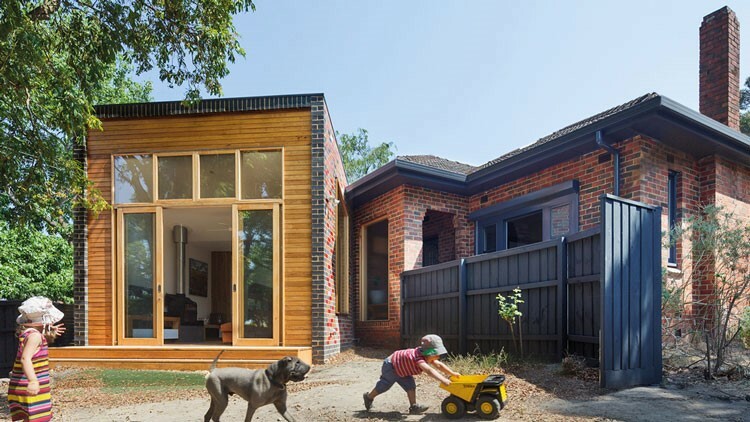 The original house is clad in a double-skin of clinker bricks. These vitrified bricks were commonly used in the area from the 1940s. 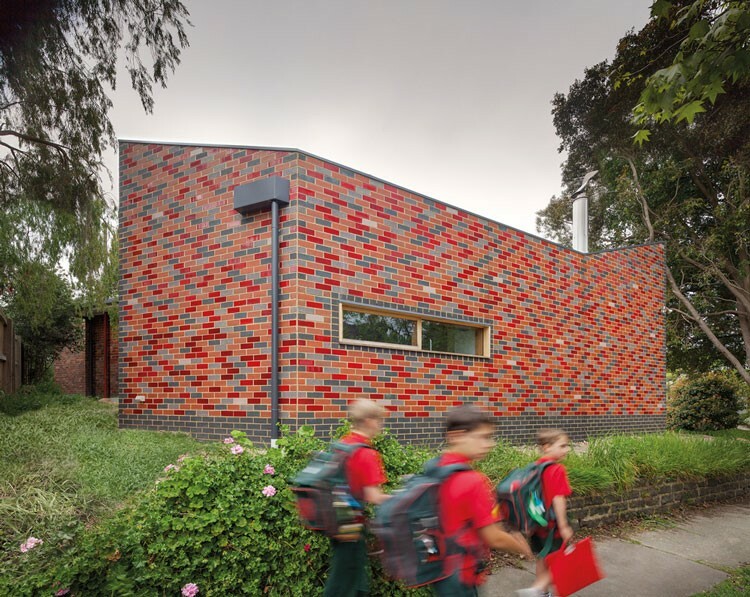 The bricks used in the new design reference the old, a combination of common and glazed bricks that sample the colours of the clinkers create a colourful abstract pattern. On the large south-western wall the pattern has the most detail and the greatest impact and has been described as being arranged as a pixelated version of the traditional. The new decorative bricks are all ‘seconds’ , frequently rejected by architects, and the inner skin are ‘thirds’ usually reserved for land fill. 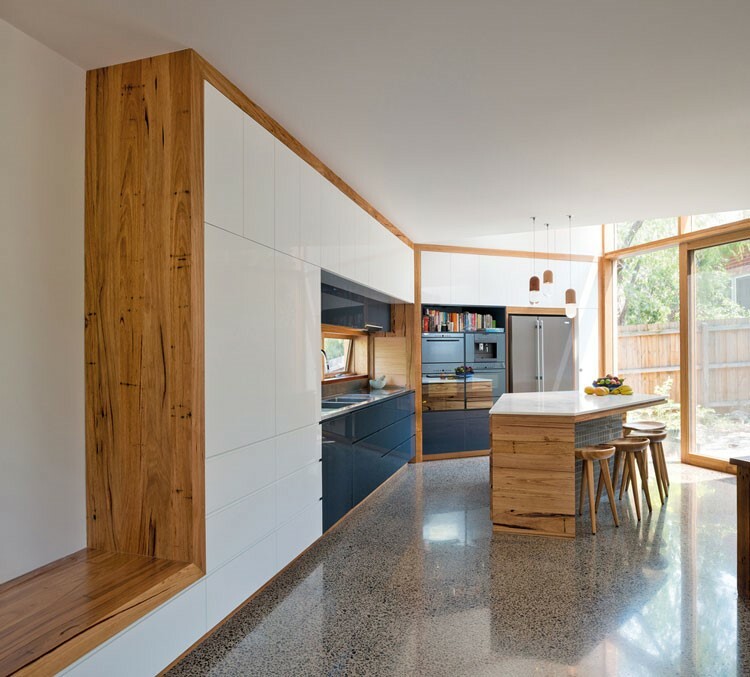 Like the site itself, the living space is an angular and roughly triangular space – three zones of sitting, dining and kitchen are all directly connected to one another. The rest of the house has been refurbished for twenty first century family living. The former front living room remains large enough to work as additional living space, a rumpus room or a home office. The new living space is at a lower floor level than the existing living space and leads down to the lower garden level. New bathrooms within the existing space have been updated with high-level tiling that recalls the Art Deco era of the original. 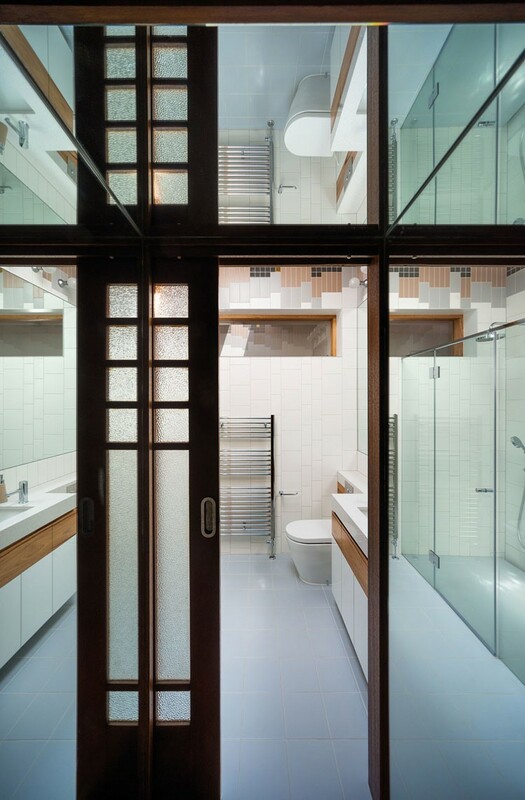 The existing floor boards in the areas of the demolished areas of the house were retained and re-used to allow for seamless connections of the new stairs and hallway. The original foyer’s white painted walls and elegant timber details are continued into the new interior. However, in the pavilion they have been described as freer and more dramatic. The timber motif changes in scale and role: from a picture rail in the original house to stairs, shelving and a low bench in the new living room. The project has both hot water and electrical solar panels on the roof and complemented by appropriate glazing and cross ventilation, the new room is said to be simple to heat and cool. The new pavilion, described as a nugget like extension, emerges from under the eaves of the triple-fronted brick house. It clearly reads as a new addition but it can be said to speak the same language as the original. It is really quite brave and unexpected but at the same time remains modest and integrates smoothly with the old.